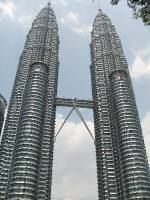 Blog from Kuala Lumpur, Malaysia | Where is the Love? The train from Singapore up the Malaysian peninsula as far as Kuala Lumpur was a relatively smooth 6 hour journey.Arriving reasonably late at night we made our way to the taxi counter inside the station and got a cheap taxi to the door of our very central and pleasant hostel, the Serai Inn.The skyline of Kuala Lumpur is dominated by the Menara Telecommunications Tower and the Petronas Twin Towers, formerly the tallest buildings in the world. On exploring the city the next day we started at the Merdeka Square, the main square and at one time the centre before the new areas arrived before cruising top the old train station, Orchard Garden, central market and making our way to Petaling street and Chinatown for lunch.At this time the city had a very south East Asian feel to it. Not at all that modern, lots of street food stalls, varied smells, very busy and loud with people always trying to sell you one thing or another. "Watch you want watch, good price". From china town after waiting for a rainy season downpour to pass by we then made our way up to Bukit Bintang and the modern shopping district.The change in feel from the two parts of the city was unbelievable.The shopping malls rivaled that of Singapore and they were mobbed with young fashionable Malaysians.Hannah was delighted to find a Top Shop and tried on various outfits while purchasing nothing.We stayed out for some dinner before heading back to the hostel and finding the Olympic 100m final on TV with some Tiger Beer. The next day we had a flight from the amazingly huge, modern and clean airport late in the afternoon so went to the top of the Menara Tower .The views were good although restricted somewhat by the smog. From here we made our way to the Petronas towers, but the viewing tickets had sold out so we went to more shopping malls to compensate. After some advice from the hostel and to save a penny or two we get the bus from the town centre to the airport instead of the very efficient train system.After turning up late and been taken three streets away to catch it we finally make it in time for our flight to Phucket.